Located at Powerstation, Macapagal Blvd. Yasubei Family Restaurant is currently my favorite Japanese resto in the Metro. They serve authentic Japanese food with good ambiance to boot. I particularly love their ebi fry set (Php280) which includes rice and miso soup. 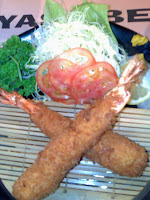 I keep meaning to ordering other items in their menu each time I go there but I always end up getting the Ebi Fry. The Shoyu Ramen (Php180) is a favorite and we just can't get enough of it. Luckily, it comes in a huge bowl- good for sharing or for one with an equally huge appetite. For sides, try the ever popular gyoza (Php180) and california maki (Php160). Very delicious. They do not scrimp on the quality of their ingredients here and I promise you the prawns will not disappoint. The sushi and sashimi are expertly prepared in their sushi bar and are made from the choicest and freshest seafood. Don't forget to try their Japanese Rice tea while there. It's free.